Our window roller shutters (also known as rollform roller shutters) are available in various profile sizes (40 mm, 44 mm, 53 mm and 77 mm), contour shapes (curved and flat) and a range of modern colours. These are our best selling products helping reduce your energy bills, reduce external noise, improve privacy, protect against intruders and protect from the weather. Uses are generally for residential situations on windows, sliding doors and garage doors as well as commercial applications on shopfronts and various other purposes. Roller shutters are a great way of providing a barrier while maximising limited space - by rolling up and out of the way they provide an unobstructed passage way when open. 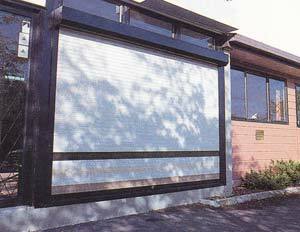 We have installed thousands of roller shutters for home & businesses across Australia. Ideal for windows, doorways, shopfronts, carports, garages and more! Our roller shutters provide the benefit of window security bars & sun awnings all in one product. Advanced Shutter Industries window roller shutters are built to last thanks to the strong aluminium construction and multiple coats of high quality fade & abrasive resistant polyamide enamel paint applied to the roller shutter slats. We have been a manufacturer of roller shutters and roller grilles since 1976 and continue to offer some of the best products available in Australia today. Available direct from our factory in Belmore (Sydney) with a professional service at competitive prices. Roller shutters increase the security of your home and are a visible deterrent to would-be intruders. Advanced Shutter Industries rollform roller shutters feature a top locking system as standard for peace of mind, and when the installation permits, manual sliding locks. Top locks are automatically activated when the roller shutter is fully lowered while manual sliding locks allow you to lock the shutter in a slightly open position allowing fresh air to pass through. The strong interlocking construction of our roller shutters resists objects being forced between the slats. Extra wide and extra thick heavy duty roller shutter guides, available as optional extras, provide a wider and more rigid channel for added security and strength against attack. Winged security end clips firmly hold slats in place, significantly reduce the possibility of slats being popped out of their guides and prevent unwanted deflection (available as optional extra only with extra wide and extra thick heavy duty roller shutter guides). This combination is one of the strongest rollform roller shutter solutions available. Gain control over your environment. Roller shutters let you block out as much external sun light and adjust ventilation to your desire at the touch of a control from within your home. High density polyurethane core slats used in Advanced Shutter Industries roller shutters will block out up to 90% of outside heat from entering your home through windows, helping you save energy and reduce electricity bills for the life of the product. Roller shutters extend the life of your furnishings (such as carpets, furniture, curtains) by protecting these from sun damage and fade. With our roller shutters you can block out as much external light (whether it is sunlight, moonlight, or street light) and adjust ventilation to your desire at the touch of a control from within your home. The high density polyurethane core slats used in our roller shutters provide acoustic insulation, and as such reduce external noise entering your home. Our roller shutters provide you with greater privacy within your own home, when ever you need it. Kindergartens, pre-schools, and night shift workers who sleep during the day will benefit from Advanced Shutter Industries roller shutters thanks to the reduced light and noise intrusion. Advanced Shutter Industries roller shutters are suitable for use in numerous applications - the possibilities are endless. Just some of the applications we have fitted our roller shutters for include window coverings, shop fronts, door ways, garage doors, carports, food serveries, food counters, bars, pubs, clubs, cafes, restaurants, drive-through windows, covers for shelves & shelving, and so on. Privacy laws require personal information to be secured under lock and key. An Advanced Shutter Industries roller shutter can be applied to shelving in, for example, medical and dental practices with minimal fuss, and without having to remove the files during installation. Our window roller shutters are simple to use and operate with a variety of manual and electric motor controlled lifting mechanisms available. The lifting mechanisms give you full control over your environment and are conveniently operated from within the safety of your own home. Advanced Shutter Industries offers all types of controls including swivel coilers (tape or cord), tape winches, steel cable winches, geared rod winders, spring-assist and 12V, 24V or 240V electric tubular motors. Generally the size of the roller shutter and its application will determine the ideal type of roller shutter lifting mechanism, however based on your preferences you can usually upgrade to a winch or electric motor lifting mechanism. Your Advanced Shutter Industries representative will be able to advise you on the best alternatives for your specific situation. Electric tubular motors for roller shutters are suitable for all roller shutters sizes all the way up to 250kg in weight. The swivel coiler strap roller shutter lifting mechanism is a popular choice offering the fastest way to open and close roller shutters. Just grasp the strap and pull down to raise the roller shutter, or grasp and feed the strap upwards to lower the roller shutter. The strap neatly coils away into the swivel coiler box. Swivel coilers are also available with a cord instead of the strap. Swivel coilers are suitable for small to medium roller shutters with a weight up to 12kg. The geared winch roller shutter lifting mechanism has a removable handle used to manually crank to raise and lower the roller shutter. Simply turn the handle clockwise to raise the roller shutter and anti-clockwise to lower the roller shutter. Geared winches attach to the roller shutter by cord, braided strap or steel cable. Various geared winch models are available for roller shutter weights up to 80kg. The rod winder roller shutter lifting mechanism has a rod which is manually cranked to raise and lower the roller shutter. Simply turn the handle one way to raise the roller shutter and the other way to lower the roller shutter. Rod winder roller shutter lifting mechanisms are suitable for roller shutters weighing up to 30kg. Advanced Shutter Industries rollform roller shutters are available in a range of colours to blend-in with or complement any home or business. This guide provides an indication of the standard colours available on various parts of our roller shutters. Most parts of a roller shutter, other than the rollform roller shutter curtain / profiles / slats, can optionally be powder coated to your preference if the standard range of colours do not suit. This colour chart shows the available colours for the roller shutter curtains of Advanced Shutter Industries roller shutters. Note: 77 mm profiles are available in white only. Patterns can be accomplished on the roller shutter curtain by using combinations of slats with different colours. The standard colours of Advanced Shutter Industries residential roller shutter bottom rail, guides, and pelmet box are shown below. These items can be optionally powder coated to other colours if required. The "reveal fit" roller shutter installation method involves fitting the roller shutter pelmet box and guides externally and within the window or door reveal. 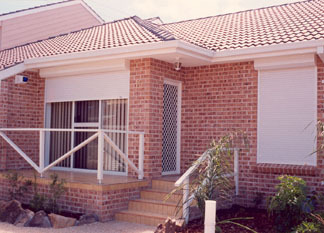 Suitability: The "reveal fit" method of installing roller shutters is feasible on most window installations, especially on brick constructions. The "face fit" roller shutter installation method involves fitting the roller shutter pelmet box above and the guides on each side of the window or door opening externally so that the opening is not obscured by the pelmet box and guides. Suitability: The "face fit" method of installing roller shutters is feasible on most door and window installations. The "under construction" roller shutter installation method involves fitting the roller shutter pelmet box within the wall cavity so that the roller shutter pelmet boxes are not visible from the outside of the house. An internal access panel matching the surrounding walls is generally fitted on the inside wall allowing access to the roller shutter for mainenance purposes. Suitability: The "under construction" method of installing roller shutters is feasible only during major renovations or construction of your home. Make sure you, your architect or your builder contacts Advanced Shutter Industries well before your renovation plans are finalised so that the right advice and information can be provided for an easy installation of "under construction" roller shutters. * For width or surface area beyond roller shutter maximum specifications use multiple roller shutters within maximum width with fixed or removable mullions if appropriate. Standard roller shutter guide dimensions: 53 x 21 mm. Optional heavy duty roller shutter guide dimensions: 62 x 21 mm. Nominal wall thickness: 5 mm. For flat 40 mm profiles only, optional winged security end caps can be used in conjunction with the heavy duty roller shutter guides. Standard roller shutter guide dimensions: 62 x 23 mm. Slats (profiles) are covered by a 5 year conditional warranty. Installation and other parts of the roller shutter are covered by 12 months warranty.